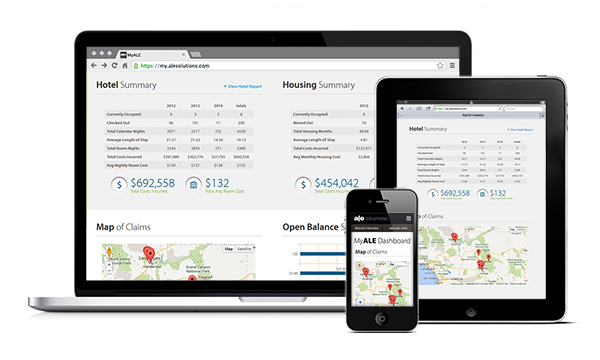 MyALE claims management portal provides adjusters and managers a simple and convenient tool to manage policyholder housing from any device. MyALE’s sleek interface allows management of all aspects of your temporary housing assignments through an easy-to-use, consolidated and personalized dashboard. Through proactive text or e-mail notifications, MyALE streamlines an adjuster’s most common time sensitive housing tasks. From placing a new housing request to extending a hotel stay, MyALE redefines productivity by reducing the number of phone calls per claim. Work smart, not more. Make your life a little easier - learn from our experience and expertise. Our training will help you improve your customer service while controlling your expenses. Our core skill-building course gives the adjuster insight into all aspects of the temporary housing process. The adjuster will learn to identify cost drivers, avoid common pitfalls, and more cost-effectively manage temporary housing for their displaced insured. Join us for a personal introduction to the MyALE claims portal. You will be guided through a live demonstration of MyALE from the initial login, through a tour of the adjuster and manager interfaces. 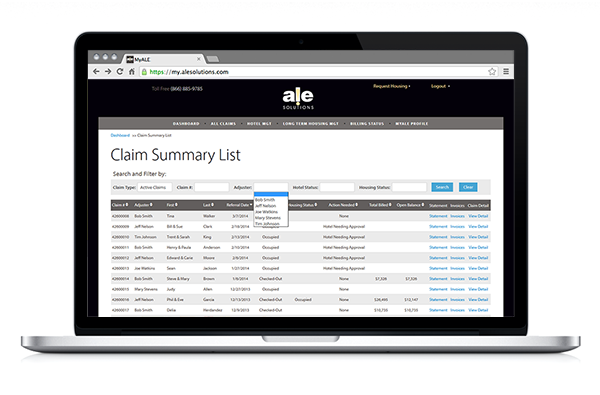 Learn about the benefits of using MyALE in managing claims. Below are just some of the frequently asked questions asked by first-time customers using ALE Solutions. Should you have any questions, not listed here, please don’t hesitate to call us or send us an e-mail. ALE Solutions saves you time, money and enhances your service to the insured. When your policyholder is in need of appropriate temporary housing, it becomes their foremost concern. They understandably expect your undivided attention until the issue is resolved. Acting on your behalf, we meet their expectations by quickly providing an appropriate hotel or temporary residence that meets their specific needs. Our prompt, personalized service means your family can turn their attention to assisting you with other aspects of the claim process. We save you money by controlling all housing related expenses. We provide the most cost-effective property by first determining the type of property that best fits the given situation. We then find all available conforming properties from which to develop the most cost-effective housing solution. By shopping among all available options, leveraging relationships with property owners and being adept at negotiating short-term residential leases we keep lease expenses low. We also provide significant savings in furniture, housewares and appliance rental costs by passing through the savings we enjoy from favorable pricing programs we have negotiated with most nationwide and regional rental companies.